Here is Aaron’s blog post, from 2007, announcing Open Library. We wouldn’t have gotten to where we are without him and we miss him. Our goal is to build the world’s greatest library, then put it up on the Internet free for all to use and edit. Books are the place you go when you have something you want to share with the world — our planet’s cultural legacy. And never has there been a bigger attempt to bring them all together. 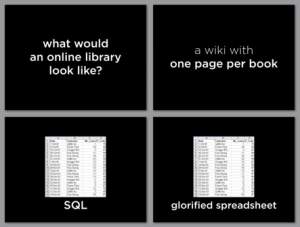 Here are his slides from his “Building the Open Library” talk also in 2007. The Internet’s Own Boy is truly one of the most significant documentaries of this time in history. Possibly Aaron would have won his case and disappeared into a peer intellect unavailable to me and not on the general public’s daily purview. His life, his work and his altruism are permanently imbedded in our psyche and will be the spark that will activate inspiration for change. His life is going to change everything. Thank you for making this film available to EVERYONE. I’ve watched this amazing documentary and learned great things about this guy, this *kid*, who did tremendously great things for the internet that I now happily play on, before he was even 25. At that age, I don’t think I even knew what the internet was. I’m almost 50 now, and having been online since about 1994, I have only toed and tinkered with things he was master of at a very young age. At this time, I continue to push forward to learn more stuff about this internet, see if *I* can figure out how to do more.